The summer after his senior year of high school James threw a perfect game and two no hitters. This is when he started getting looks, his first and only year of junior college at Mercer County Community College (MCCC). 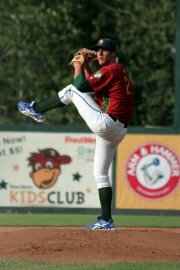 He went from closer to starter just like that, and here he is today with YOUR Boise Hawks. James has to wear compression sleeves because he likes the way it feels on his elbow, it makes his arm last longer, at one point he went 90 days eating the same meal from Subway for lunch, a “wheat BMT instead of ham and turkey because I don’t like ham, shredded cheese (don’t melt it), lettuce, oil, vinegar, cheddar SunChips and Fuse iced tea, on road trips James throws away his toothbrush at the end of each series, don’t worry he has one that he uses when they are home, he does not drink soda and he licks two of his fingers before he pitches. Routine or superstition, he must think it works. What he misses most about home are his friends and his car. James is a fanatic about working on his car. When talking to his teammates his car is the first thing that comes to surface about him. He has a 09 Voltswagon GTI and loves European cars. He also enjoys fishing and hanging out with his friends. « The 5 F’s of the 4th!